Now Available from Beacon Press, Amazon.com, and an independent bookseller near you! Blending the effective use of grassroots campaigns, aggressive lobbying, and a well-tended career path for conservative law students and attorneys, the Religious Right has already succeeded in influencing major court decisions on a range of critical social issues. The courts have chipped away at laws banning prayer in school; bolstered restrictions on women’s access to abortion and birth control; and given legal approval to President Bush’s use of federal funds for religious organizations. In the near future, the courts will surely decide on a host of hot-button issues, from stem cell research and gay rights to religious expression on government property and euthanasia. 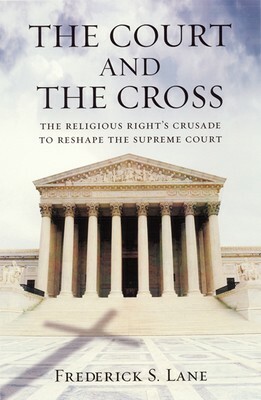 In The Court and the Cross, legal journalist Frederick Lane uses a mix of legal history and political analysis to expose, in layman’s terms, the Religious Right’s high court offensive. He clearly explains the Supreme Court’s nomination process and shows how the Religious Right’s leadership, including Pat Robertson and the late Jerry Falwell, created the vision that led to the movement’s massive growth and its powerful influence on the nation’s judiciary. This timely book details the Right’s unrelenting efforts to destroy the wall separating church and state and, ultimately, to do nothing less than declare the United States a Christian nation. “Separation of church and state is so basic a part of American values and history that it is hard to realize it is under threat. But it is, profoundly. In The Court and the Cross Frederick Lane explains why: a relentless, determined and successful campaign by the Christian Right to put its supporters on the federal courts, especially the Supreme Court. It is a colorful and compelling book.” — Anthony Lewis, author of Gideon’s Trumpet and Freedom for the Thought That We Hate: A Biography of the First Amendment. A Thousand Things to Talk about … and Then Some!